La Gabri-elle - Italian Imports Gift ShopOpen weekdays by appointment.Email or call 847 219-3678 and we will open the shop just for you! Email or call 847 219-3678 and we will open the shop just for you! 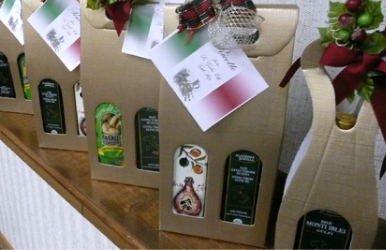 La Gabri-elle specializes in gourmet Italian gift baskets and gift basket themes. Come and find the perfect gift for birthdays, special occasions, and the Holidays. Sumptuous gourmet products such as biscotti, espresso coffee, taralli, pasta,and jams imported from Italy. We have a great selection of olive oils, balsamic vinegars, olives, tomato sauce, and much more. Ceramics, linen, and scarves are also available. You are sure to find something to please every taste and style at a very reasonable price. If you need a unique corporate or personal gift, you have found the place to shop. Custom gift baskets are also available all year round. Great selection of ready-to-give gift sets! Weekdays by appointment Please call or email and we will open the shop just for you!!!! Copyright 2019 La Gabri-Elle. All rights reserved.